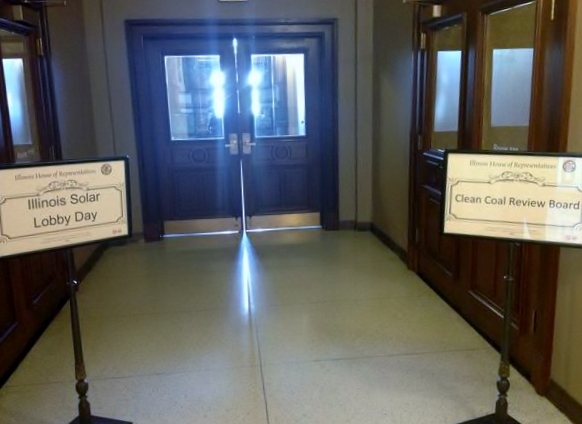 Thursday August 7th the Illinois Power Agency hosted a second public workshop to discuss the execution of HB 2427, the one-time procurement for $30million in Solar Renewable Energy Credits. The agenda and supporting documents can be found on the IPA web page. About 70 people participated in the discussions and seemed to represent a vast group of stakeholders including both local and national installers (primarily residential but also some commercial), home owners, Environmental Law and Policy Center, Elevate Energy, CUB, utilities (including ComEd, Ameren, a few ARES), the Metropolitan Mayor Caucus, Wind on the Wire and several wind developers, Wanxiang and many others. Kicking the meeting off, Anthony Star reviewed the legislative language which broadly discusses time frames, $30m cap, 50% of the procurement must be systems <25kW, contract durations for a minimum of 5 years, credit requirements for participants and finally the broad use of aggregators. The language of the bill was intentionally left relatively loose, allowing the IPA some latitude to create a program based on industry and public input. In many respects, Illinois is fortunate that we can have a “test run” of a REC program which can help when crafting a more permanent solution. Next NERA, the IPA regular procurement administrator, presented on trends and lessons learned in other state procurement focusing primarily on NJ, CT and DE. These states have many similarities to Illinois and the intent is to learn from their experiences while putting the IL program guidelines together. The final presentation was a review of the consolidated responses to the survey the IPA put out in July soliciting public comment and feedback. All individual responses including those submitted by The Illinois Solar Energy Association can be found on the IPA website. The remainder of the meeting was focused on discussing the broader issues to be tackled and defined. These comments will be taken under advisement by the IPA over the next 90 days as they develop a draft procurement plan. Much of this conversation was very similar to the June 12th workshop but additional points were discussed in detail. No decisions or preferences have been expressed officially at this time but it is clearly obvious that the IPA is eager to create something based strongly by market interest. The IPA will publish the draft procurement plan by September 29th, followed by a public comment period through October 14th. The ISEA would love your input so please feel free to comment here on the blog to continue the conversation. Saturday, June 28th, Governor Quinn signed House Bill 2427 authorizing the Illinois Power Agency (IPA) to direct a one-time $30 million procurement of RECs. In anticipation of the Governor’s signature, the IPA held a preliminary stakeholder workshop on June 12th, to discuss the program design for implementing the Supplemental PV Procurement Plan. Many questions were raised about the role of aggregators, treatment of new vs. existing systems, need for credit requirements, contract terms and overall procurement process. The IPA solicited written comments, which were due on Monday, July 21st. and can be found on the IPA website (http://www2.illinois.gov/ipa/Pages/Plans_Under_Development.aspx). The program design is officially underway at this stage and will evolve through a series of public workshops and program drafts from the IPA before being submitted to the Illinois Commerce Commission (ICC) later this year. ISEA submitted comments with the over-arching theme to keep the one-time procurement simple and transparent to ensure success and create consumer and legislative confidence with the aim of demonstrating a working, long-term solution for the RPS program. ISEA recommends creating 3 subcategories for the procurement. The first subcategory would be for large commercial projects between 400 kW – 2 MW. Although the ISEA comments did not officially comment on pricing techniques, it has been recommended by others that the procurement process for this subcategory should be a competitive bid process for a 5 year contract for RECs. The payment would be a performance-based incentive (paid out for 5 years based on system production). The second subcategory would be for commercial systems between 25 kW – 399 kW. ISEA recommends flexibility be allowed with regards to payment type (upfront payment or PBI) and that system owners could chose the payment terms. The third subcategory would be for systems < 25 kW, typically residential projects. The < 25 kW procurement would be set up like a Declining MW Block program. The declining block structure allocates specific capacities and provides incentives, which decline according the amount of PV deployed based on the capacity targets. The IPA would determine the money available for each block and the corresponding SREC price. The system owner would receive upfront payments when the system is energized. Half of the recs procured will from systems smaller than 25 kW. ISEA suggests that the IPA hire a Third Party Administrator to handle the procurement, contract execution and other administrative functions. ISEA also recommends that eligible systems be required to be completed no later than 12 months after the date of the SREC contract. Applicants can apply for a 6 month extension, which would be reviewed by the IPA or Third Party Administrator. Eligible projects that are not initially selected should be placed on a waiting list. With regards to new vs. existing systems, ISEA recommends that existing systems be defined as those that were energized between July 1, 2013- June 30, 2014. New systems should be defined as those that were energized after July 1, 2014. It is important that “new” be related to the passage of HB 2427 as opposed to the final definition of both process and terms by the IPA. Existing systems in the < 25 kW category would be priced below the lowest “declining block” as the value to the industry is the lowest having already been built. The IPA is hosting a public workshop on August 7th, 2014 from 10am-3pm. Please plan to participate as stakeholder input is important. The IPA will release the draft plan on September 29th and public comments will be due on October 14th. The IPA will revise the draft plan and submit the revised plan with the Illinois Commerce Commission by October 28th. The ICC has a deadline of January 26th, 2015 to approve the IPA’s plan. Renewable Portfolio Standard (RPS): It is official!! The State of Illinois has authorized a one-time $30 million procurement of Solar Renewable Energy Credits. Additional funds may also be released for separate wind/solar procurement if the IPA determines that it must procure conventional electricity on behalf of Ameren. Although that will be a separate fund and process, these strategic steps could have an influence on the solar procurement as well. On June 12th the Illinois Power Agency held the first of a series of planning sessions, seeking public input to the structure and delivery of this program. The legislation included language allowing for various segments of the market (systems greater than 2MW and those under 2MW with subgroups under 25kW as well). This approach will ensure a robust market place, driving the greatest amount of solar development as well as jobs and economic development in various solar segments. It will be up to the IPA to determine the specifics of each of these aspects and future workshops will dive deeper into defining terms and guidelines including pricing/adders for utility/large/small systems, NEW versus OLD systems, eligibility dates for generated power, registration processes, deposit/credit requirements if any, the need/no need for aggregators, possible prepayment options, contract terms, performance guarantees as well as many other fine points. Procedurally there will be several more steps in defining this program. Once the governor has signed the bill (expected in the next 25 days) the official 90 day workshop period will begin. Upon completion the IPA will then have 14 days to put official guidelines together which are then available for public comment. At that point the Illinois Commerce Commission will have 90 days to review before proposing official language and sending to the Joint Commission for Administrative Rules for finalization. All totaled it is likely the process could run through Feb/April 2015 and the procurement would be executed immediately after. The goal is to actually procure REC’s and enter into contracts before the end of the 2015 fiscal year but it could stretch beyond that date. Please watch for future workshops and plan to participate as input from all stakeholders will be important! Note that this one-time fix isn’t the end! We will continue to work with many state and national organizations for a permanent fix to the RPS. Strategic sessions will begin later this summer and work will begin immediately to ensure passage next spring. If you can, please let your legislators know this is important to you and keep telling them! More information will be available as these strategic sessions evolve but we will need everyone’s shoulder on the wheel in order to succeed in Springfield in 2015! Net Metering: As you may know, most energy players in Illinois are not compliant with the Net Metering laws. The ICC has been accepting public comments to draft rule changes issued May 13th. Brad Klein of The Environmental Law and Policy Center (ELPC) has been leading the charge on making the necessary legal corrections and ISEA has been working to assist them. These official responses are available on the ICC website<http://www.icc.illinois.gov/electricity/NetMetering.aspx>. Various entities formally introduced their comments to Commission Staff which was then discussed amongst other participants. These discussions included the need for increased education among both the ARES organizations as well as end consumers, increased customer support for net metering applicants, a more streamlined process for customers switching between suppliers and the need for language clarification within the existing statute to ensure identical rates are applied to net metering customers among other things. There were few points of opposition until the end of the call when ComEd expressed very strong objections to net metering in general describing this policy an illegal subsidy. The ELPC reminded ComEd that the point of this rule making was not to undue net metering but to firm up the existing regulatory process with the aim of improving customer processes and the fair execution across the state. Not exactly sure if this is a warning of contentious times ahead but we should be diligent and prepared to publicly address and defend the value of solar to the market place if necessary. We may be gearing up for stronger battles ahead and will need a tremendous amount of support from all solar businesses, customers and supporters! Interconnection: The final of 3 scheduled public workshops on interconnection was held on June 12th regarding the connection process with the utility. IREC has been driving these negotiations along with the ELPC and revised drafts from the ICC staff should be publicly available soon. These rules have been pretty good to date but are becoming dated as the energy sector changes. ISEA has been participating in this legal process and as Illinois works to have one of the most up to date processes for interconnection with a utility in the country. Once the ICC issues new guidelines they will have another 14 day public comment period. Please watch ISEA newsletters for that announcement. US EPA releases draft proposal to cut carbon pollution from the nation’s power plants: On Monday June 2nd, President Obama announced bold new goals that will cut power plant emissions 30% by 2030. This is incredibly exciting and we will be digging in to better understand the implications for solar. Individual states will be given the responsibility for developing a compliance strategy, so it is imperative that we all stay engaged and participate in this process in order to ensure that we are positioned for the greatest deployment and impact on our clean energy future! Saturday May 31 marked the end of the legislative year and a lot happened the final week of legislation. Here’s the rundown. SB103/HB2864 [RPS Fix]: The Illinois Renewable Portfolio Standard (RPS) has not been working as originally intended and procurements for solar and wind projects have been on hold for the past two years. A permanent RPS fix has been tabled until 2015 given the complex shifts occurring with Exelon and power in Illinois. ISEA and our partners will continue to work to get this vital legislation back on track in order to achieve the 25% clean energy goal by 2025. This conversation starts NOW, not next spring so please roll up your sleeves and let legislators know how vital this fix is to you and why. ISEA will be sending out periodic reminders and specific requests over the next 9 months to keep this conversation alive and a top priority for the state! Please let us know if you need specific support at an event with your legislators. HB2472 [Renewable Energy Resource Fund]: in lieu of a permanent RPS fix, the legislature has authorized the Illinois Power Agency (IPA) to hold a one-time supplemental procurement of $30 million in solar energy beginning Spring 2015! This funds SRECs purchases. The details will be worked out during public workshops which will begin on June 12th. All are invited to participate to be ensure this program is well designed. Please watch your inbox for details. If you tried to participate in RECAP but did not get in – this is your path toward a sustainable, sizeable solution! • Authorized aggregators to broker between system owners and the state. The thresholds for this first round may differ from the full RPS strategy as it is a special procurement. • Bring a solid REC price at public auction. If you were unable to get into to the RECAP program – Please participate in this process to ensure a strong clean energy future in Illinois. This special procurement is an exciting first step and, although not everything that we may have wanted, a HUGE win for solar in Illinois! Thanks to all who supported the RPS fix as this would not have been possible without all of your hard work! If you have not seen it, please read the Crain’s article announcing that the RPS is off the table for this legislative session. Unfortunately this appears to be true as the legislature has concerns about future Exelon nuclear plant closures. This is quite frustrating as Exelon has been quoted in the press as not wanting government subsidies and the RPS fix had tremendous support from many commercial, professional, environmental and grassroots organizations across the state as well as both chambers in Springfield. According to the Crain's article, one of the reasons for the closures is the claim that wind subsidies make it impossible for nuclear power to be cost competitive. It is certainly very disappointing and frustrating but this is not the end. As the article mentions, there is potential for a solar procurement for 2015 through the RPS program. Since the IPA has not been able to spend the Renewable Energy Resources Fund (RERF), there is an opportunity to allocate the fund toward a solar-only procurement. We will share the updates this week as final details and amounts are being worked out. Specifically we realize all will want to know how this will work as it pertains to existing/new solar projects and the amount of funding which is thought to be between $20million and $72million. It is pretty clear that the RPS will not be able to fund wind projects but we are still determining the possibilities for solar including DG projects. Hope this provides a little insight and hope into a bleak article. More details will continue to evolved as this unfolds. ISEA Solar Lobby Day is a Success! Many thanks to the energetic and passionate attendees who came out in full force. Everyone did an amazing job educating lawmakers and advocating for the RPS. Solar enthusiasts and supporters attended the ISEA Legislative Solar Social the evening prior to Lobby Day at Maldaner’s Restaurant. Seven State legislators attended, including Senate President John Cullerton, many of the legislators took the opportunity to tour the solar array on the roof of Maldaner’s Restaurant. THANK YOU TO OUR SOLAR LOBBY DAY SOCIAL SPONSORS! Quite a lot going on within the world of solar policy at the moment! Here’s a quick summary but please let us know if you have any questions or feedback. In order to keep everyone aware and engaged, we are looking at hosting regular webinars and will also communicate via ISEA newsletters and blogs. Watch your email for dates and schedules! As you may know, the Illinois Renewable Portfolio Standard (RPS) requiring 25% of all state energy to come from clean sources by 2025 is broken. Technical problems with the funding calculations means IL would not have a Renewable Energy Credit (REC’s) program until 2018. ISEA is the only source of state REC’s currently through the RECAP program and it is closed for the year. Fixing the RPS will drive more sales, resulting in more clean energy, increased savings, energy independence and more solar JOBS. A fix is close at hand and we will be heading to Springfield to walk the floors and get support for passage, Here are a few talking points and links to look up your legislators. State rebates and grants are set to sunset in December 2015. Sounds like a long time but that is tomorrow in legislative years. We are working with state legislators to expand rebates possibly to 2020 which will help home owners and businesses with the upfront costs and help stimulate the growth needed to continue to push installation prices down. We are going to need your help so please watch for more information. Remember the Disney movie “Horton Hears a Who”? ISEA is launching an awareness campaign designed to let lawmakers and policy makers on all levels know WE ARE HERE! We are asking all solar installers, industry partners and most importantly – SYSTEM OWNERS – to write, call, visit senators, representatives, mayors, aldermen, city clerks and anyone else you can think of! Brag about what you've done and get noticed! We will provide you with pre-written letters to make it easy and links on our website will help you track down contact information! Please support us with this vital step in growing the industry. We know it will take a little work but strongly believe we need to start shouting: We are Here, We are Here, We are Here! Please support us with this vital step in growing the industry. The Environmental Law and Policy Center has filed with the Illinois Commerce Commission (ICC) to update the renewable energy interconnection standards to be in line with FERC standards revised late last year. This should streamline the application process, particularly for larger projects and eliminate some of the initial uncertainty during feasibility studies. Residential systems might even be able to eliminate redundant disconnects which will save time and money. For specific language, please refer to the Illinois Interconnection Docket. Public workshops will be announced soon and we will share those dates. Although Illinois law requires all electric supplier to offer net metering, not all of the Alternate Retail Energy Suppliers (ARES) are in compliance. The ICC has been working on resolution and will be hosting a public workshop for comments on new guidelines and requirements. We hope you'll be able to attend and we'll let you know as soon as we hear. Shannon Fulton, ISEA Board President and Director of Illinois Business Development for StraightUp Solar, recently returned from SW Uganda where she served as a WE CARE Solar Ambassador training local health facility staff on the installation, use, and maintenance of the Solar Suitcase. WE CARE stands for Women’s Emergency Communication and Reliable Electricity and provides an innovative solar solution in a little yellow suitcase of power called the Solar Suitcase, designed to provide lighting and enable communication to save the lives of mothers and babies during childbirth. Click here for more information about the Solar Suitcase and WE CARE Solar. WE CARE's recent project in SW Uganda is part of the African Medical and Research Foundation (AMREF) grant awarded by Grand Challenges Canada to support the Saving Lives and Birth (SLAB) initiative to improve maternal mortality outcomes in 4 districts in rural SW Uganda, specifically in the Districts of Kabale, Kisoro, Rukungiri, and Kanungu. The project includes 105 health centers of various sizes and 147 solar suitcase systems. Fulton's role as a Solar Suitcase Ambassador is to co-train with three other Ambassadors and Co-Founder Hal Aronson approximately 30 local health inspectors and cold chain technicians, teaching them to install, use, and maintain the Solar Suitcase systems. 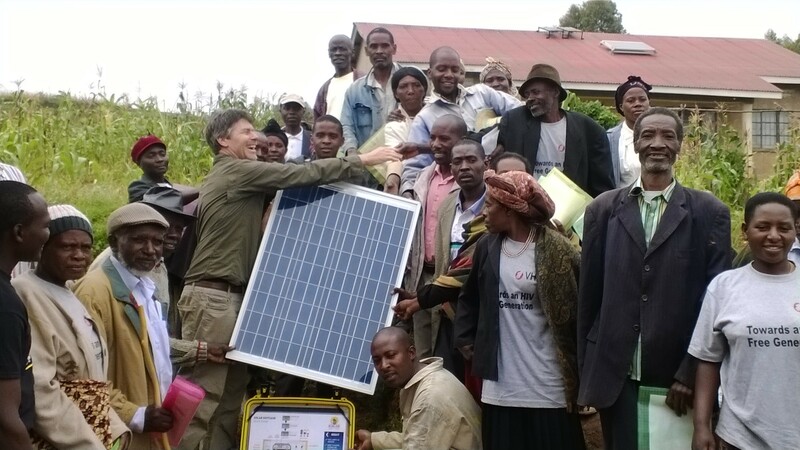 The Solar Suitcase systems incorporated different components for this area of Uganda, including two 80 W modules and a 38Ah Victron battery to accomodate lower sun resource conditions than typically present at the equator, but that exist in SW Uganda due to the elevation and misty microclimate. Community leaders at one of the health centers accept the Solar Suitcase system as their own before WE CARE started construction. This presentation to the community happened at the beginning of each intallation and in one case at a larger facility, the community erupted in song and dance! The children always appeared at every health center to watch and enjoy with excitement. They were such fun! One young beautiful grinning girl ran alongside our departing vehicle and shouted "You have loved us!" Our team for the installations in Kabale District. Ugandans are such polite, patient, and loving people - full of life! Their engaging kindness and warmth effortlessly dissolves our communication and cultural boundaries. Please feel free to read Shannon's ISEA Facebook posts,which record her work in Uganda. Welcome to the new Illinois Solar Energy Association website! ISEA is working hard to ensure that our members' interests are protected and promoted. One of the many ways we are doing this is through the development of this new user-friendly website. Check out the business members' logos at the bottom of the home page. Corporate and premier members' logos link directly the business website. Charter members' logos are linked to the member's profile. The business member search page has been cleaned up and all business members' logos have been added. We encourage all ISEA business members to update their profile pages. As the industry continues to grow, so too does both ISEA membership and visits to the website. We want to ensure that those who are considering doing business with you are encouraged to do so through a professional and informative profile. Stay tuned for updates on ISEA advocacy work, public presentations, professional education, new programs, events and workshops. ISEA is working for you! Public written comments on the DG Certification ruling (Docket 12-0213) are due on Monday December 17th 2012. Please provide your written comments directly to the Illinois Commerce Commission. It is imperative that you detail how this ruling will impact your business. In our interpretation, there are 3 basic issues with the statute: the definition of “install”, the definition of “qualified person” and the certifications that will be recognized and the fee structure. Please note, the process on how to provide comments is outlined below. distributed generation facility with the electric utility’s distribution system . However the subsequent language of what it does not include creates confusion and ambuguity. · Tasks not associated with the electrical interconnection of the distributed generation facility, including those relating to planning and project management performed by individuals such as an inspector, management planner, consultant, project designer, contractor or supervisor for the project. 3. Currently, the Application fee for certification is $3,000 with an annual re-certification report of $500. Penalty for noncompliance is $6,000. · Displace highly trained individuals from employment. The Illinois DCEO is required to run a small business impact study to determine how the DG certification ruling will affect solar businesses in Illinois. As such, please also email a copy of your comments to Katy Khayyat at her email address below and copy Lesley.mccain@illinoissolar.org.